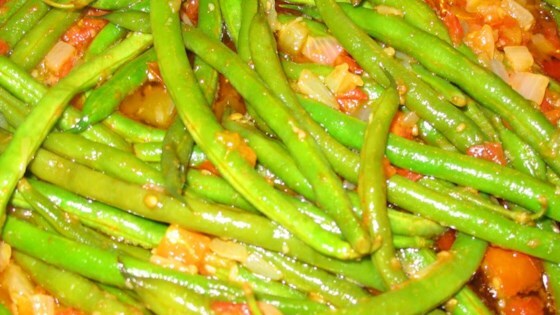 "A nice mix of green beans, onion, and tomatoes simmered until soft and delicious! Just like Ya Ya used to make!" Heat the olive oil in a large skillet over medium heat. Cook and stir the onions and garlic in the skillet until tender. Mix the green beans, tomatoes, sugar, and salt into the skillet. Reduce heat to low, and continue cooking 45 minutes, or until beans are soft. Green beans simmer with tomatoes and onions until tender and yummy. I'm not a big fan of green beans, but I loved these! Used canned beans, a can of tomatoes w/onion & garlic + 2 small onions and garlic. Omitted the salt. Delish!